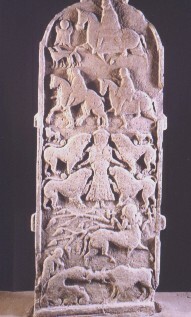 This shows the back of Meigle no.2, an upright cross slab. At the top of the slab there is a horseman, on the right, with hounds and an angel above them, in front of him, on the left. Below this there are three horsemen riding abreast with another riding behind them, on the right. Below this, Daniel is in the lion's den (Old Testament, Daniel 6:18). The prophet is in the centre with two lions on either side, and possibly a lion cub (?) above them on the left. Below this there is a centaur with an axe in each hand and a branch from a tree under his right arm. At the bottom there is a man, on the left, with a club over his right shoulder. In front of him, to the right, there is a dragon seizing a horned beast by the nose.